A true first in Horology, The Greubel Forsey Double Balancier 35° features two inclined fixed-oscillators. This unique regulating system comprises two inclined oscillators and escapements. They are driven through a spherical differential, which provides the average of their rates via the gear train to the time display. Since 1999, when Robert Greubel and Stephen Forsey began their ground-breaking research into inclined oscillators, they concentrated first on the great challenges of those mounted in rotating cages and then continued at the start of the 21st Century into studying inclined fixed oscillators. The first working prototype from Greubel Forsey’s 6th fundamental invention with inclined escapement was initially a movement with two inclined oscillators, each at 20° and this was unveiled at Baselworld in 2009. This superimposed concept resulted in an exclusive six timepiece edition under the Greubel Forsey EWT label in 2011. Consequently the timepiece presented today is an evolution from this first concept. The two inclined oscillators are no longer superimposed, but are spatially disposed in different three dimensional planes. A movement with two oscillators inclined in different three dimensional planes offers two notable factors in the pursuit for improved chronometric performance. Firstly the inclined oscillators act in stabilised positions to significantly reduce the possibility to be in either a horizontal (flat) or vertical position.The second is that the two inclined fixed oscillators are linked by a spherical differential that averages rating differences and ensures an optimal performance at all times whether in stabilised ( horizontal or vertical) positions or dynamically (on the wrist) . 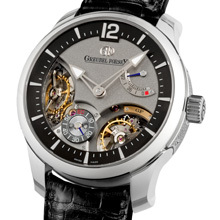 Greubel Forsey’s fundamental research into oscillators working in inclined planes was confirmed by the precision chronometric results of the Greubel Forsey Double Tourbillon 30° Technique which took first place in the 2011 International Chronometry Competition. Signature Greubel Forsey skeletonised gold hands with high-legibility Super-LumiNova tips indicate the time against a polished black-oxidised gold chapter ringBetween the two visible inclined balances of the Double Balancier 35°, the small seconds at 7 o’clock displays the running instantaneous average of the two regulators, while a 72-hour power reserve indicator at 2 o’clock keeps track of the optimal power available from the two co-axial, fast-rotating mainspring barrels. The 35° inclination of the inclined balances allows for larger diameter balance wheels (better inertia for more stable timekeeping) in a very comfortably-sized 43.5mm case. The Greubel Forsey Double Balancier 35° is a one-off unique edition of just six pieces in an18k white gold caseensuring exclusivity. As with all Greubel Forsey timepieces, the level of hand-finishing and decoration throughout the Double Balancier 35° is without compromise. Movement components are designed with forms that bring out their beauty to maximum effect, offering myriad sublime details to be discovered and esteemed. Frosted plates, black flat polished steel and stunning hand-polished bevels with sharp internal angles (which machines cannot do as well as a highly experienced hand) bring unparalleled vivacity. Large jewels set in polished gold chatons, and mirror-polished screws provide evidence of the extremely high quality that pervades every aspect of this timepiece. Thecomplete manual winding movement comprises 365 components, 28 of which make up the spherical differential. It is powered by two concentric fast-rotating mainspring barrels thatprovide optimal power for72 hours. The two oscillators feature variable inertia balance wheels, Phillips terminal curves and beat at 3Hz/21,600 APH.Plates and bridges are in nickel silver, frosted and spotted, with polished bevelling and countersinks, straight-grained flanks and anthracite treatment (NAC). The case is available in 18k white gold,measures 43.5 mm in diameter by 14.35 mm high and featuressynthetic sapphire crystals on the dial side and for the display back. Three-dimensional, variable geometry shaped lugs, screwed fixing, raised polished engraving “Double Balancier 35°” on a hand-punched background, gold security screws, two engraved hand-finished white gold plates screwed to the caseand and a hand-engraved individual number. The black alligator strap is hand stitched with a white gold folding clasp.